We look after the health of our kiddies pretty well. We eat well, we watch how and when we medicate and we supplement carefully to suit each persons needs. Sometimes though we need extra support and this is the case for my son who still suffers from a nasty ongoing post nasal drip. A couple of weeks back he asked me if he would have a runny nose forever and that was enough for me! I had had enough and decided to see if I could use essential oils to support his post nasal drip and hopefully ease the dripping nose. There are a couple of essential oils that can help with this issue which is basically the production of excess mucus in the back of the nose and throat. My boy has a dust allergy and this contributes to the post nasal drip. Lemon essential oil- this essential oil has mucolytic, anti-septic and anti-bacterial properties. Lavender essential oil- which has antihistamine, regenerative and sedative properties, Then Peppermint essential oil- which has expectorant, anti-inflammatory and antispasmodic qualities. These 3 oils together form an allergy trio and help with all the symptoms of an airborne allergy, one of these symptoms is a post nasal drip. I also used Oregano essential oil which has anti-viral, anti-bacterial and immunostimulant properties, and the last essential oil that was recommended for a post nasal drip was Tea Tree. I was all out of Tea Tree so used Manuka oil instead. Manuka oil has similar properties to Tea Tree these being a decongenstant, antiseptic and antibacterial qualities. I made a balm with the above oils (see here and here for other balm recipes) Balms are a wonderful gentle way of using essential oils topically. I also made a blend of the oils in a glass bottle with a dropper top. 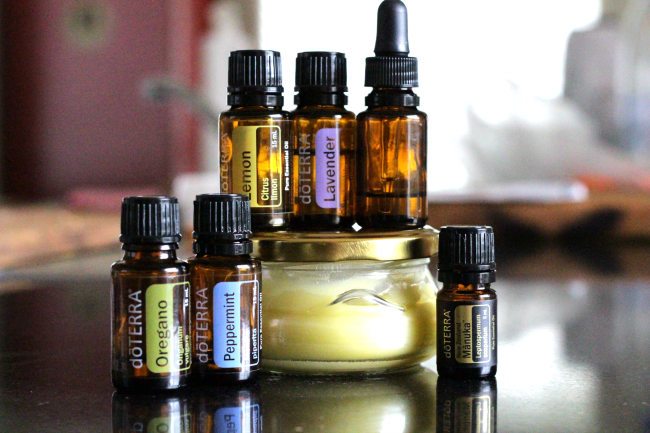 I used the balm on my son’s throat before bedtime and then used 6 drops of the blend in his bedroom diffuser. 20 drops each of Lavender, Peppermint, Lemon, Tea Tree (or Manuka oil). This may seem like a lot but remember you are making over half a cup of balm and this will last you for months even used every night. I used a pea sized dollop of balm on my son as a dose each night. The result? SUCCESS! His symptoms were alleviated and initially I used the balm and blend every night but have since dropped back to when he needs it. He does have a dust allergy so this is in no way a “cure” but at least I have a natural, powerful and gentle way to manage the post nasal drip flareups. If this is something you or a loved one suffers from, this would be worth a try! How long did it take to get the post nasal drip under control?